Showing items in category North Borneo, sorted by newest listed first. NORTH BORNEO - 1941 10c rate 'PASSED FOR TRANSMISSION/10' cover to UK with 2c 'War Tax'. 1941 (OCT.12.) 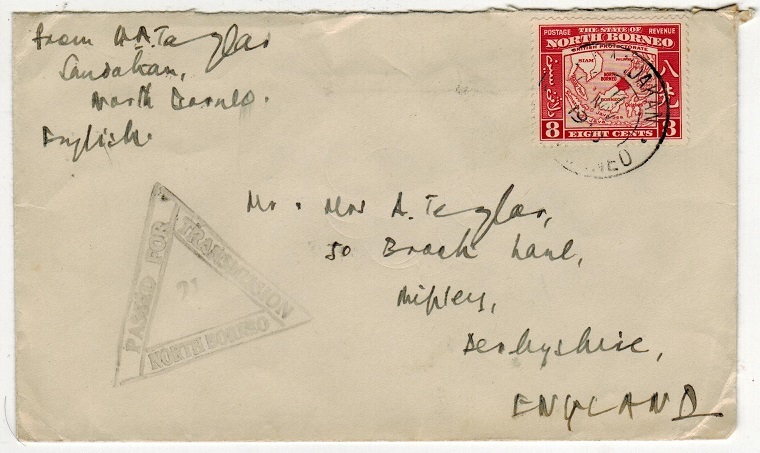 cover addressed to UK bearing 8c adhesive in combination with 2c 'War Tax' adhesive tied SANDAKAN/NORTH BORNEO and struck by red triangular PASSED FOR/ TRANSMISSION/NORTH BORNEO/10 censor handstamp at left. 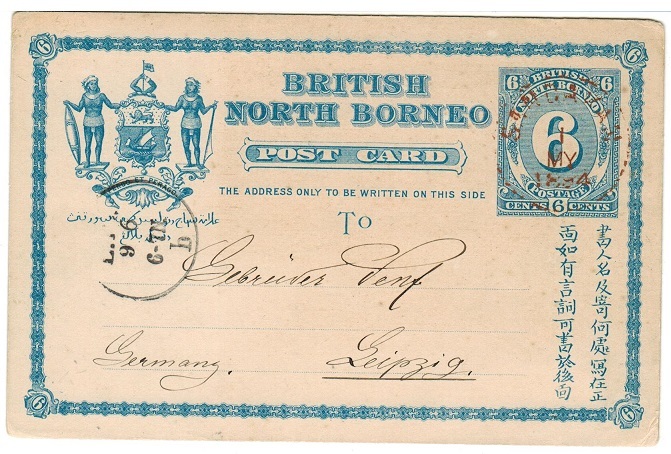 NORTH BORNEO - 1889 6c blue PSC to Germany used at SANDAKAN. H&G 5. 1889 6c blue on cream postal stationery postcard addressed to Germany (short message on reverse) cancelled by SANDAKAN cds struck in 'RED' ink and dated 1.MY.1894. H&G 5. 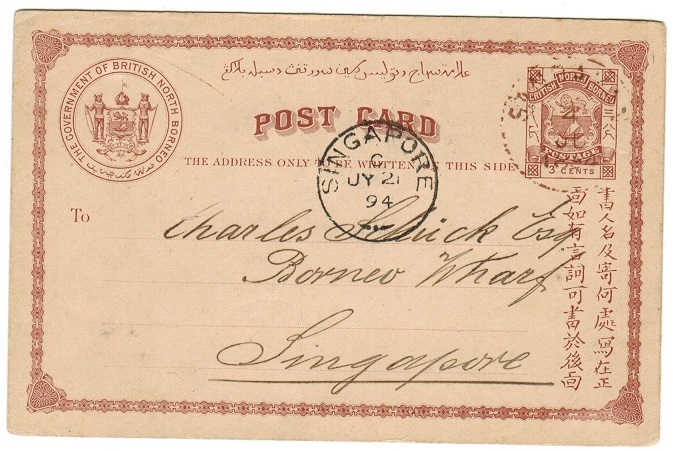 NORTH BORNEO - 1889 3c red-brown PSC to Singapore used at SANDAKAN. H&G 4. 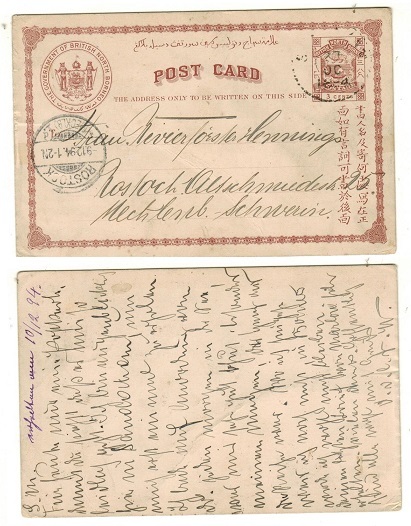 1889 3c red-brown on cream postal stationery postcard addressed to Singapore with short message on reverse cancelled by SANDAKAN cds in 'BROWN' ink dated 4.JY.94 with SINGAPORE arrival cds at left. H&G 4. 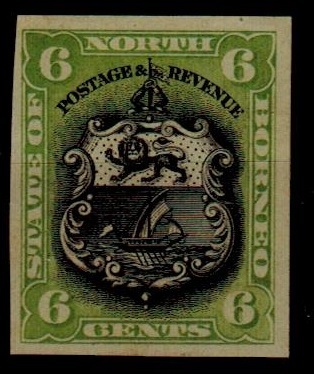 NORTH BORNEO - 1889 8c green PSC to Germany used at SANDAKAN. H&G 6. 1889 8c green on white postal stationery postcard addressed to Germany (genuine use) cancelled by SANDAKAN cds dated 15.JUIN.1905 with LABUAN transit at left and BRESLAN arrival. H&G 6. NORTH BORNEO - 1889 6c blue PSC to Holland used at KUDAT. H&G 5. 1889 6c blue on white postal stationery postcard addressed to Holland cancelled by KUDAT cds dated JA.16.96 with LABUAN transit b/s dated JA.21.1896. ZUTPHEN arrival on front. H&G 5. NORTH BORNEO - 1909 16c (SG type 60) IMPERFORATE PLATE PROOF. 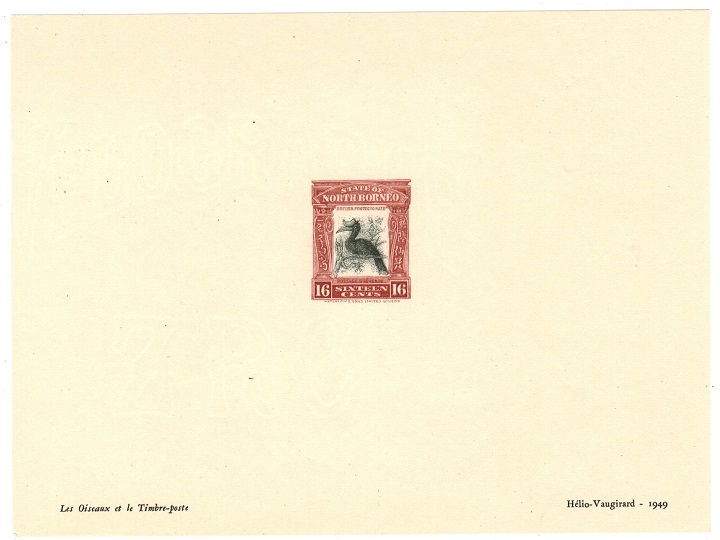 1909 16c 'Rhinoceros Hornbill' (SG type 60) IMPERFORATE PROOF printed by Helio Vaugirard printers in 1949 on VELOGRAPHE/ZRC watermarked paper (155x116mm). Used as a sample of their work. Fine and unusual item. 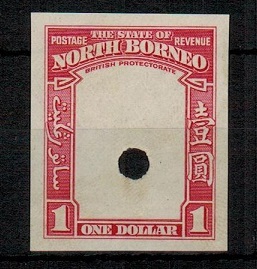 NORTH BORNEO - 1909 12c (SG type 59) IMPERFORATE PLATE PROOF. 1909 12c black and deep blue 'Palm Cockatoo' (SG type 59) in a fine IMPERFORATE PLATE PROOF sheetlet printed by Helio-Vaugirad in 1949. Helio Vaugirad being French printers and this proof was issued to show the quality of their work and was included in their book 'Les Oiseaux et Le Timbre Poste. Scarce item printed on Velograph ZRC paper. NORTH BORNEO - 1894 $1 scarlet IMPERFORATE PLATE PROOF block of four with grilled duplex's. 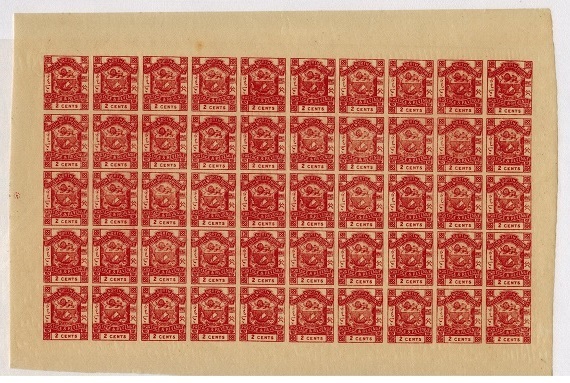 1894 $1 scarlet (SG type 32c) in a fine IMPERFORATE PLATE PROOF corner marginal block of four cancelled by two grilled duplex's printed on ungummed paper. NORTH BORNEO - 1889 3c red brown PSC to Germany used at SANDAKAN. H&G 4. 1889 3c red brown on cream 'Postage' postal stationery postcard addressed to Germany (genuine use) cancelled by large part SANDAKAN cds dated 23.OC.1894. H&G 4. NORTH BORNEO - 1941 2c 'War Tax' PASSED FOR TRANSMISSION/8/NORTH BORNEO cover to UK. 1941 (JUN.7) cover to UK bearing 8c (SG 308) tied in combination with the 1941 2c 'War Tax' adhesive (SG 319) by JESSELTON/NORTH BORNEO cds with violet triangular PASSED FOR TRANSMISSION/8/NORTH BORNEO censor marking. A fine & scarce cover with the 'War Tax' stamps being very elusive on cover. NORTH BORNEO - 1941 1c 'War Tax' PASSED FOR TRANSMISSION/20/NORTH BORNEO cover to UK. 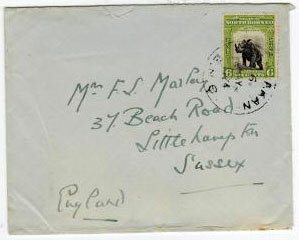 1941 cover addressed to UK (two small paper tabs adhered over the addresse and first line of address) bearing 4c pair tied in combination with 1c 'War tax' pair (SG 318) by light SANDAKAN cds. Struck at lower left by oval PRINCIPAL MEDICAL OFFICER/B.N.G. h/s and struck by scarce red triangular PASSED FOR/TRANSMISSION/NORTH BORNEO/20 h/s. A scarce censored use of these war stamps. NORTH BORNEO - 1940 8c rate 'PASSED FOR TRANSMISSION/30/NORTH BORNEO' cover to UK. 1940 (OCT.14.) 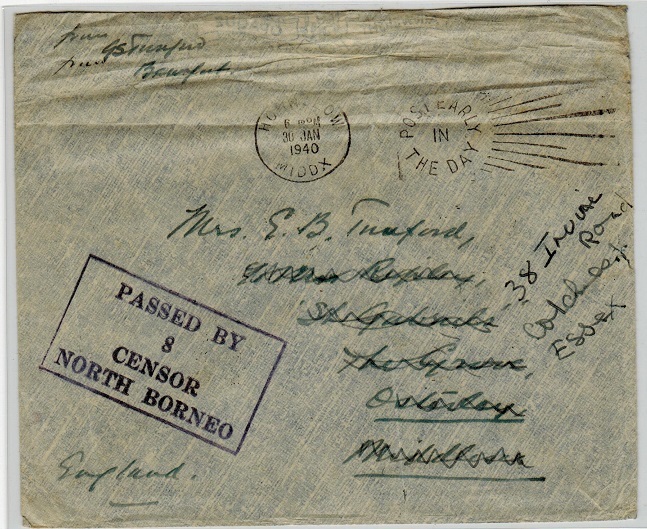 cover addressed to UK bearing 8c adhesive tied by SANDAKAN/NORTH BORNEO cds with black triangular PASSED FOR/TRANSMISSION/NORTH BORNEO/30 censor mark applied. 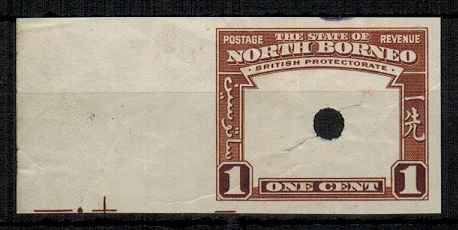 NORTH BORNEO - 1940 8c rate 'PASSED FOR TRANSMISSION/21/NORTH BORNEO cover to UK. 1940 (NOV.11.) 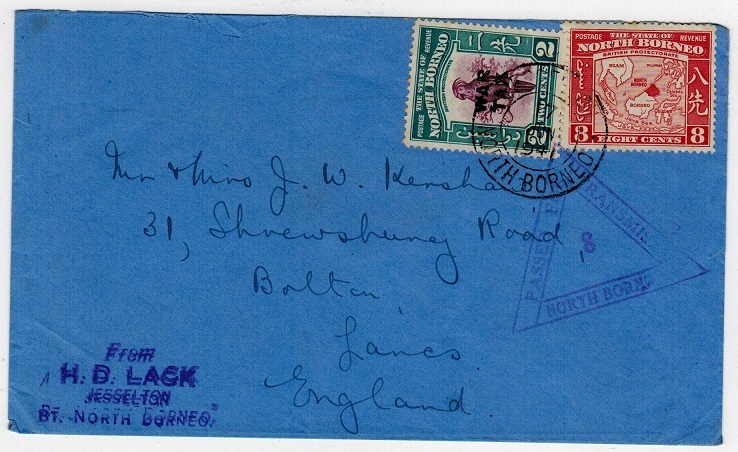 cover addressed to UK bearing 8c adhesive tied SANDAKAN/NORTH BORNEO with black triangular PASSED FOR/TRANSMISSION/NORTH BORNEO/21 h/s applied. (Morenweiser type 2). 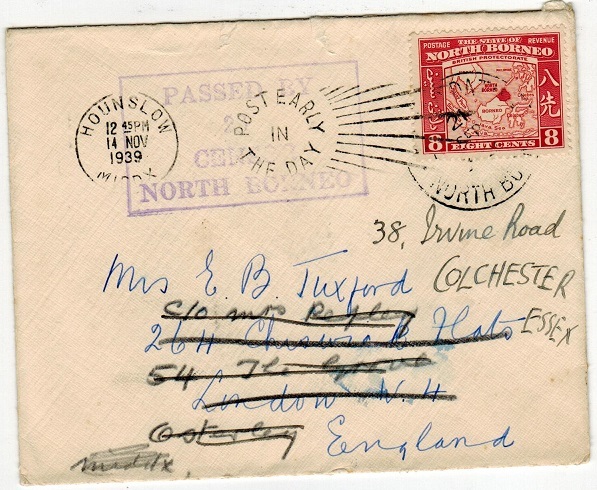 NORTH BORNEO - 1939 'PASSED BY CENSOR/8' cover to UK used at BEAUMONT. 1939 (DEC.5.) cover addressed to UK (some creasing at top edge from opening) bearing 1c and 3c adhesives pairs tied to reverse flap by BEAUMONT/NORTH BORNEO cds's with JESSELTON transit and struck on front by very fine boxed PASSED BY/8/CENSOR/NORTH BORNEO h/s applied in bluish-black. (Little type 1A). 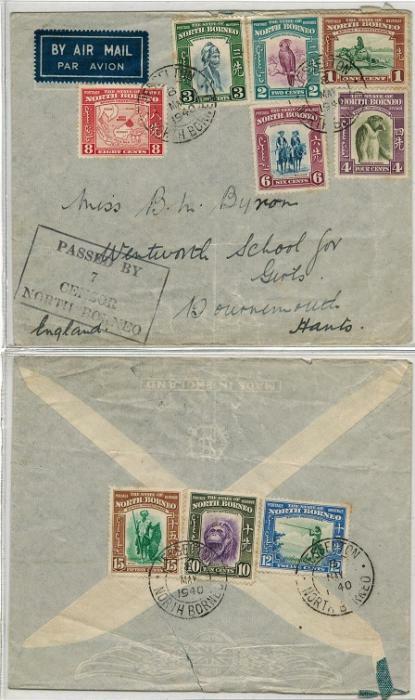 NORTH BORNEO - 1940 'PASSED BY CENSOR/7' cover to UK used at JESSELTON. 1940 (MAY.8.) cover addressed to UK (two ironed out folds) bearing 1c,2c,3c,4c,6c and 8c adhesives tied by JESSELTON/NORTH BORNEO cds's with scarce black boxed PASSED BY/7/CENSOR/NORTH BORNEO h/s. Additional 10c, 12c and 15c adhesives on reverse flap. 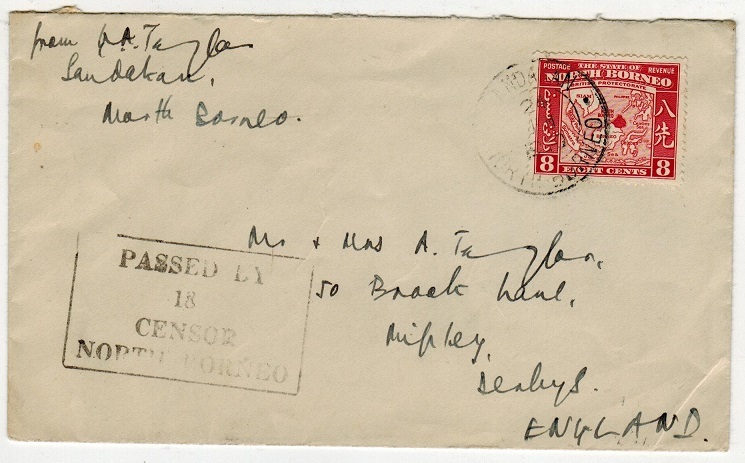 NORTH BORNEO - 1940 8c rate 'PASSED BY CENSOR/18' cover to UK used at SANDAKAN. 1940 (JUN.24.) 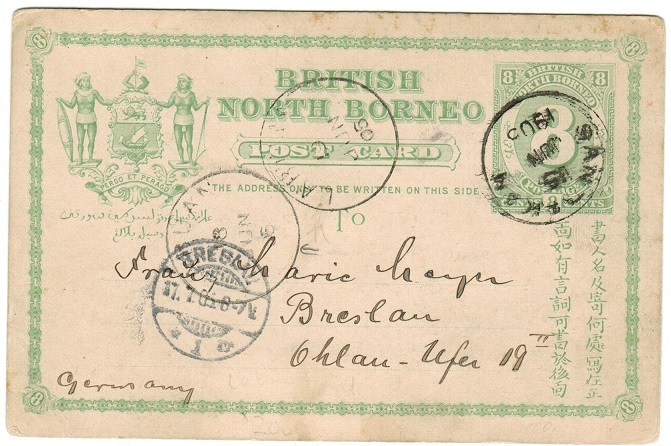 cover addressed to UK bearing 8c adhesive tied SANDAKAN/NORTH BRONEO with black boxed PASSED BY/18/CENSOR/NORTH BORNEO h/s applied. (Moreweiser type 1). NORTH BORNEO - 1939 8c rate 'PASSED BY CENSOR 28' cover to UK used at LADAD DATU. 1939 (NOV.14.) 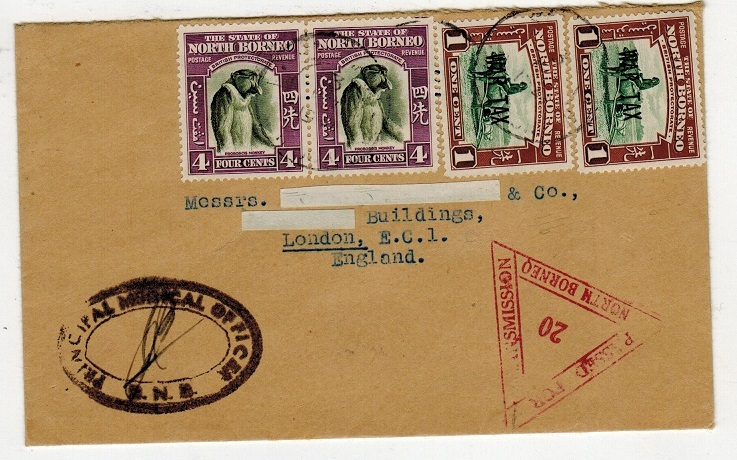 cover addressed to UK bearing 8c adhesive tied by LADAD DATU/NORTH BORNEO cds with scarce violet boxed PASSED BY/28/CENSOR/NORTH BORNEO h/s at left (Little type 1A). SANDAKAN transit b/s. NORTH BORNEO - 1939 early 'PASSED BY CENSOR 29' cover to UK used at LADAD DATU. 1939 (NO.16.) 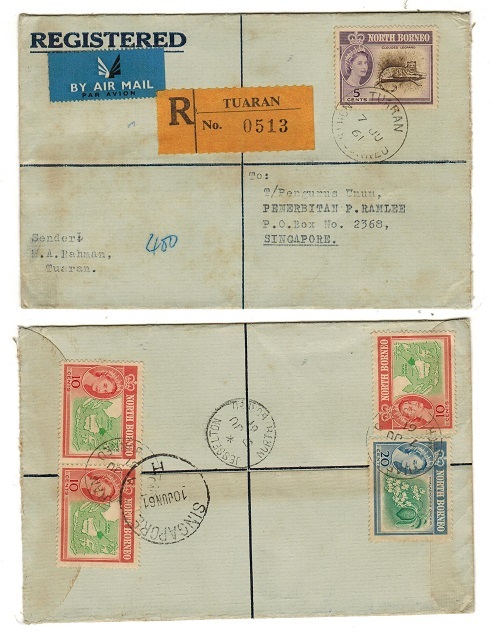 cover addressed to UK (a little tatty at top from opening) bearing 20c strip of three tied by LAHAD DATU/NORTH BORNEO cds's with violet VIA IMPERIAL h/s applied at left below air mail sticker. Struck by scarce black boxed PASSED BY/29/CENSOR/NORTH BORNEO h/s and with JESSELTON transit b/s. NORTH BORNEO - 1941 1c 'War Tax' adhesive mint with OVERPRINT DOUBLE, ONE ON REVERSE. SG 318. 1941 1c green and red-brown 'War Tax' adhesive in fine mint condition showing the major variety OVERPRINT DOUBLE ONE ON REVERSE SIDE. Unlisted. SG 318. NORTH BORNEO - 1902 25c registered cover to UK used at SANDAKAN. 1902 (DE.18.) 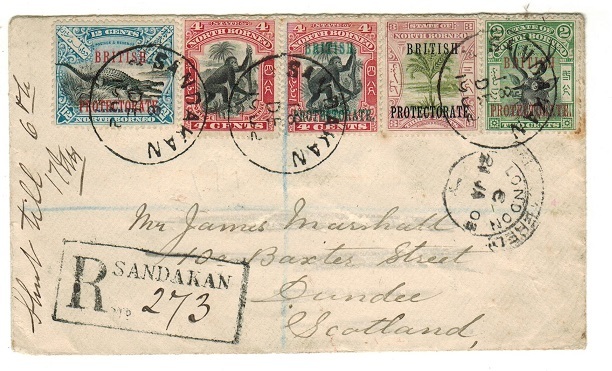 registered cover to UK bearing 2c, 3c, 4c (x2) and 12c 'British Protectorate' overprint adhesives (SG 128,129,130 and 135) tied by SANDAKAN cds's with black boxed R/SANDAKAN registered h/s at lower left. 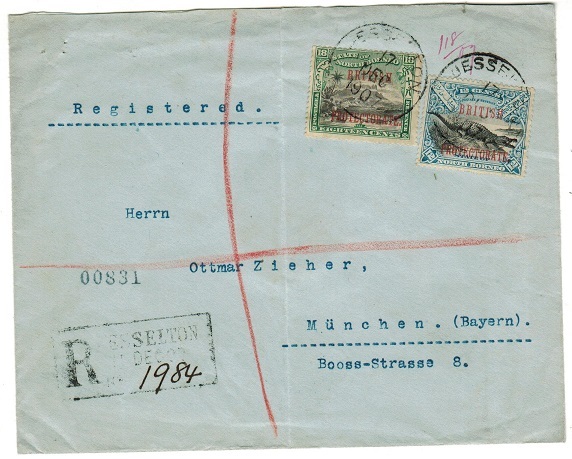 NORTH BORNEO - 1907 30c rate registered cover to Germany used at JESSELTON. 1907 (DEC.17.) registered cover to Germany bearing 'British Protectorate' 12c and 18c overprints (SG 135+136) tied by individual JESSELTON cds's. Black boxed R/JESSELTON registered h/s at lower left. 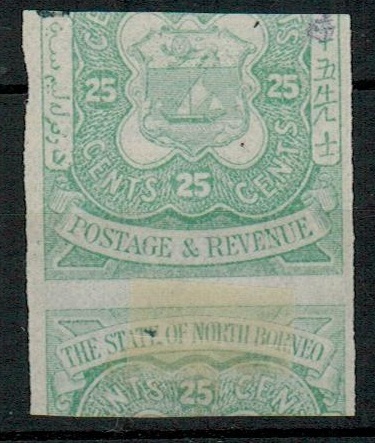 NORTH BORNEO - 1942 2c 'War Tax' adhesive used overprinted for Japanese use. SG J17. 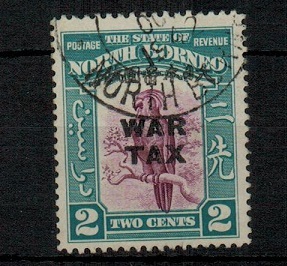 1942 2c purple and greenish blue adhesive overprinted WAR TAX with Occupation Of Japanese handstamp applied at top in black and cancelled by NORTH BORNEO cds. Complete with a scan of a letter from Milo Rowell stating the stamp to be genuine. SG J17. NORTH BORNEO - 1931 6c IMPERFORATE PLATE PROOF pair (SG type 74) of the frame in orange. 1931 6c IMPERFORATE PLATE PROOF of the frame and value tablet (SG type 74) in a fine horizontal pair printed in the issued colour of orange and with official punch hole at top edge. NORTH BORNEO - 1939 $1 (SG type 93) IMPERFORATE PLATE PROOF of the frame only. 1939 $1 IMPERFORATE PLATE PROOF of the frame and value tablet (SG type 93) printed in the issued colours of carmine on gummed paper with official security hole. NORTH BORNEO - 1939 $1 (SG type 93) IMPERFORATE PLATE PROOF. 1939 $1 IMPERFORATE PLATE PROOF of the frame and vignette (SG type 93) printed in the issued colours of carmine on gummed paper with official security hole. NORTH BORNEO - 1939 15c (SG type 89) IMPERFORATE PLATE PROOF of the frame only. 1939 15c IMPERFORATE PLATE PROOF of the frame and value tablet (SG type 89) printed in the issued colours of brown on gummed paper with official security hole. 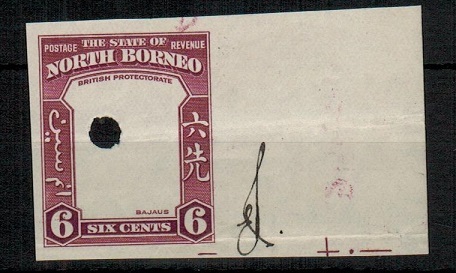 NORTH BORNEO - 1939 15c (SG type 89) IMPERFORATE PLATE PROOF. 1939 15c IMPERFORATE PLATE PROOF of the frame and vignette (SG type 89) printed in the issued colours of blue green and brown on gummed paper with official security hole. NORTH BORNEO - 1939 4c (SG type 84) IMPERFORATE PLATE PROOF of the frame only. 1939 4c IMPERFORATE PLATE PROOF of the frame and value tablet (SG type 84) printed in the issued colours of violet on gummed paper with official security hole. 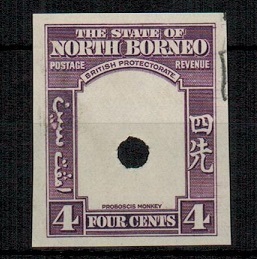 NORTH BORNEO - 1939 4c (SG type 84) IMPERFORATE PLATE PROOF. 1939 4c IMPERFORATE PLATE PROOF of the frame and vignette (SG type 84) printed in the issued colours of bronze green and violet on gummed paper with official security hole. NORTH BORNEO - 1939 3c (SG type 83) IMPERFORATE PLATE PROOF of the frame only. 1939 3c IMPERFORATE PLATE PROOF of the frame and value tablet (SG type 83) printed in the issued colours of green on gummed paper with official security hole. 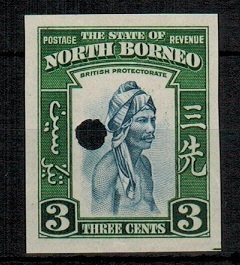 NORTH BORNEO - 1939 3c (SG type 83) IMPERFORATE PLATE PROOF. 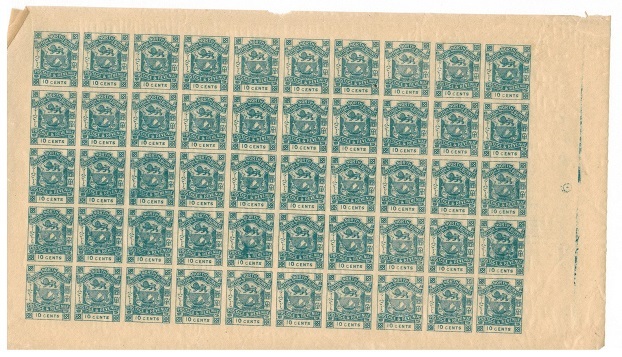 1939 3c IMPERFORATE PLATE PROOF of the frame and vignette (SG type 83) printed in the issued colours of slate blue and green on gummed paper with official security hole. 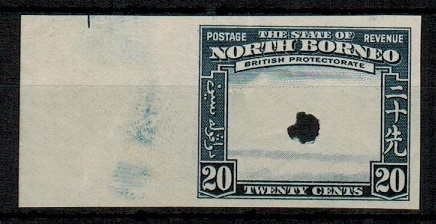 NORTH BORNEO - 1939 2c (SG type 82) IMPERFORATE PLATE PROOF of the frame only. 1939 2c IMPERFORATE PLATE PROOF of the frame and value tablet (SG type 82) printed in the issued colours of greenish blue on gummed paper with official security hole. 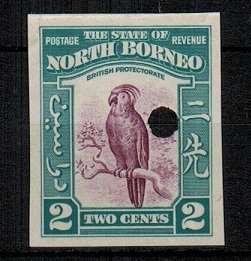 NORTH BORNEO - 1939 2c (SG type 82) IMPERFORATE PLATE PROOF. 1939 2c IMPERFORATE PLATE PROOF of the frame and vignette (SG type 82) printed in the issued colours of purple and greenish blue on gummed paper with official security hole. NORTH BORNEO - 1939 1c (SG type 81) IMPERFORATE PLATE PROOF of the frame only. 1939 1c IMPERFORATE PLATE PROOF of the frame and value tablet (SG type 81) printed in the issued colours of red-brown on gummed paper with official security hole. NORTH BORNEO - 1939 1c (SG type 81) IMPERFORATE PLATE PROOF. 1939 1c IMPERFORATE PLATE PROOF of the frame and vignette (SG type 81) printed in the issued colours of green and red-brown on gummed paper with official security hole. 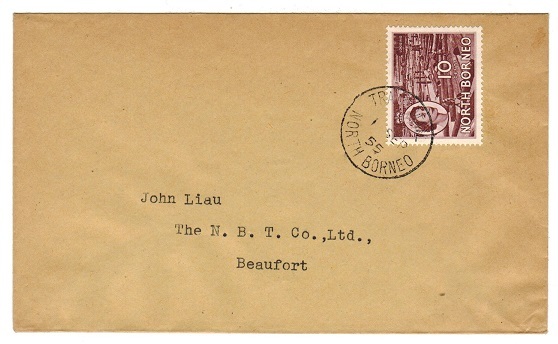 NORTH BORNEO - 1961 registered cover to Singapore used at TUARAN. 1961 (JU.7.) 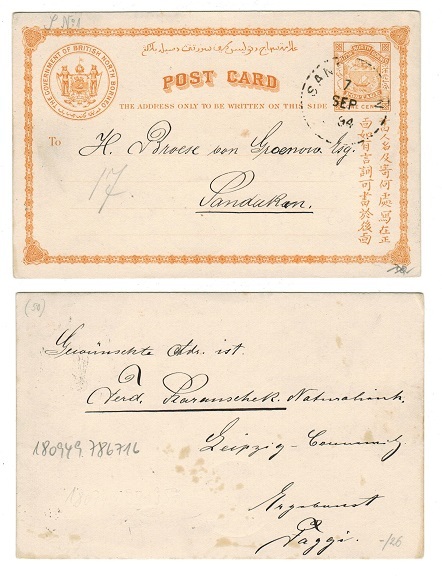 registered cover to Singapore (very light tone marks) bearing 5c on front and 10c (x3) plus 20c on reverse side tied by scarce TUARAN/NORTH BORNEO cds with black on yellow-orange R/TUARAN/No. Registered label. NORTH BORNEO - 1939 6c IMPERFORATE PLATE PROOF of the frame and value tablet. 1939 6c IMPERFORATE PLATE PROOF of the frame only (SG type 85) printed in claret as issued on gummed paper with official security hole. NORTH BORNEO - 1939 20c IMPERFORATE PLATE PROOF of the frame and value tablet. 1939 20c IMPERFORATE PLATE PROOF of the frame only (SG type 90) printed in slate blue as issued on gummed paper with official security hole. NORTH BORNEO - 1939 50 IMPERFORATE PLATE PROOF of the frame and value tablet. 1939 50c IMPERFORATE PLATE PROOF of the frame only (SG type 92) printed in violet as issued on gummed paper with official security hole. 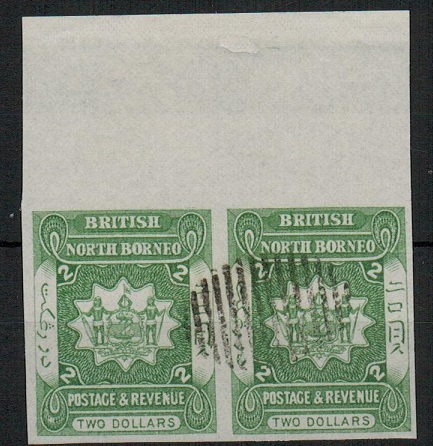 NORTH BORNEO - 1894 $2 dull green IMPERFORATE cto'd pair. SG 84a. 1894 $2 dull green (SG type 32d) top marginal IMPERFORATE HORIZONTAL pair cancelled by 14 barred duplex in black. SG 84a. 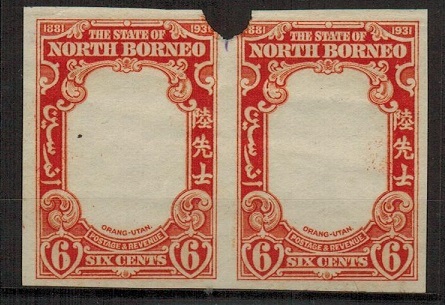 NORTH BORNEO - 1894 $1 scarlet IMPERFORATE cto'd pair. SG 83b. 1894 $1 scarlet (SG type 32c) top marginal IMPERFORATE HORIZONTAL pair cancelled by 14 barred duplex in black. SG 83b. 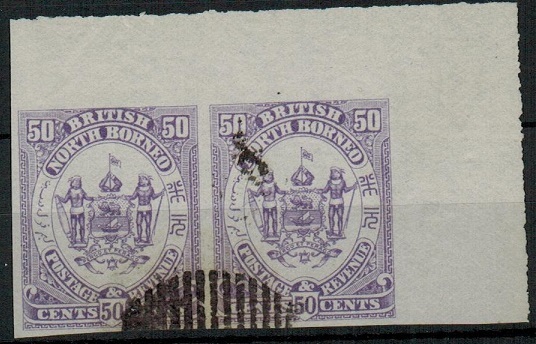 NORTH BORNEO - 1894 50c deep slate purple IMPERFORATE cto'd pair. SG 82a. 1894 50c deep slate purple (SG type 32b) top right corner marginal IMPERFORATE HORIZONTAL pair cancelled by 14 barred duplex in black. SG 82a. NORTH BORNEO - 1911 25c black and yellow-green IMPERFORATE PLATE PROOF pair. 1911 25c black and yellow (SG type 64) in a fine IMPERFORATE PLATE PROOF pair. NORTH BORNEO - 1888 1/2c magenta 'Fournier' forgery sheet of 50. SG 36. 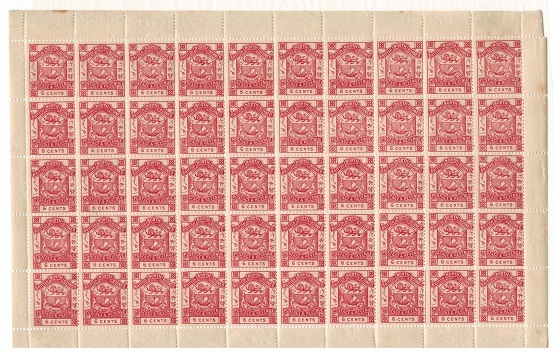 1888-92 1/2c magenta 'Fournier' forgery complete mint sheet of 50 with a few odd small edge faults. SG 36. NORTH BORNEO - 1888 1c orange 'Fournier' forgery sheet of 50. SG 37. 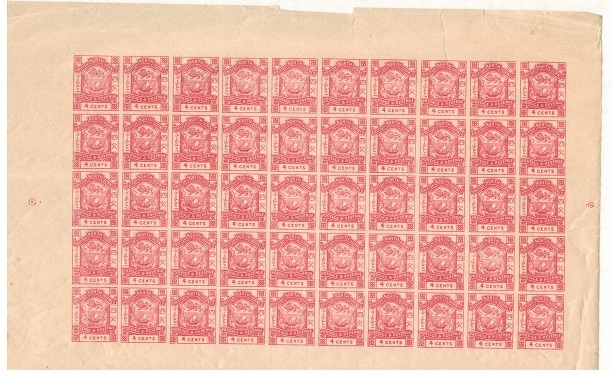 1888-92 1c orange 'Fournier' forgery complete mint sheet of 50. SG 37. NORTH BORNEO - 1888 2c brown 'Fournier' forged IMPERFORATE sheet of 50. SG 38. 1888-92 2c brown 'Fournier' forgery complete 'IMPERFORATE' mint sheet of 50. SG 38. NORTH BORNEO - 1888 3c violet 'Fournier' forgery sheet of 50. SG 39. 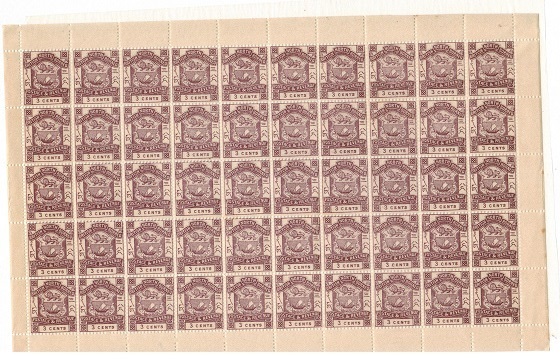 1888-92 3c violet 'Fournier' forgery complete mint sheet of 50. SG 39. NORTH BORNEO - 1888 4c rose pink 'Fournier' forged IMPERFORATE sheet of 50. SG 40. 1888-92 4c rose-pink 'Fournier' forgery complete 'IMPERFORATE' mint sheet of 50 with some edge faults and tear into stamp 8. SG 40. NORTH BORNEO - 1888 5c slate 'Fournier' forgery sheet of 50. SG 41. 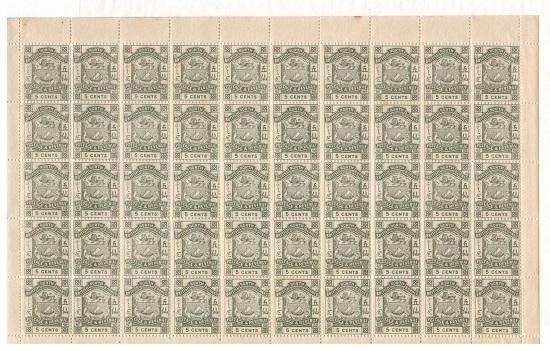 1888-92 5c slate 'Fournier' forgery complete mint sheet of 50. SG 41. NORTH BORNEO - 1888 6c lake 'Fournier' forgery sheet of 50. SG 42. 1888-92 6c lake 'Fournier' forgery complete mint sheet of 50. SG 42. NORTH BORNEO - 1888 6c lake 'Fournier' forged IMPERFORATE sheet of 50. SG 42. 1888-92 6c lake 'Fournier' forgery complete 'IMPERFORATE' mint sheet of 50. Some minor edge faults. SG 42. 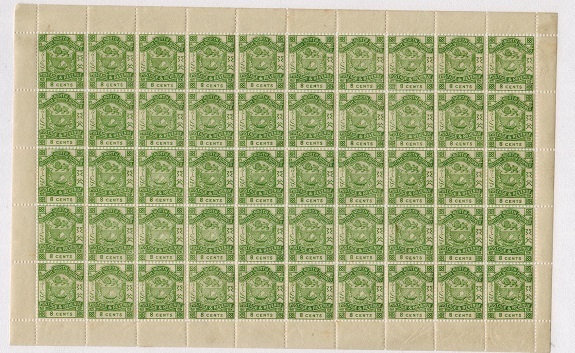 NORTH BORNEO - 1888 8c yellow-green 'Fournier' forgery sheet of 50. SG 43a. NORTH BORNEO - 1888 10c dull blue 'Fournier' forgery sheet of 50. SG 44b. 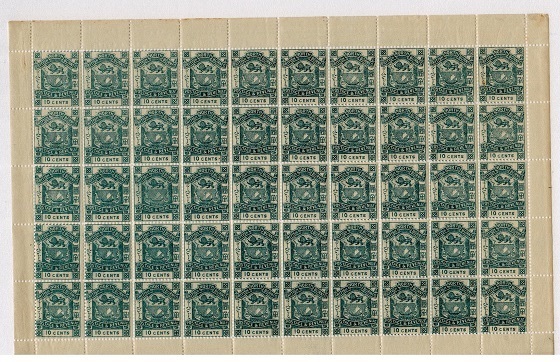 1888-92 10c dull blue 'Fournier' forgery complete mint sheet of 50. SG 44b. NORTH BORNEO - 1888 10c blue 'Fournier' forged IMPERFORATE sheet of 50. SG 44. 1888-92 10c blue 'Fournier' forgery complete 'IMPERFORATE' mint sheet of 50. SG 44. 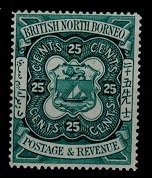 NORTH BORNEO - 1897 18c black and green mint with variety IMPERFORATE TO LEFT MARGIN. SG 108. 1897-1902 18c black and green (perf 16) mint example (heavy hinge and tone mark on reverse) but showing the variety IMPERFORATE TO LEFT MARGIN. SG 108. 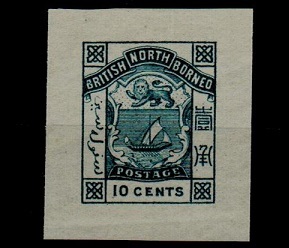 NORTH BORNEO - 1888 10c IMPERFORATE DIE PROOF printed in indigo. 1888 10c IMPERFORATE DIE PROOF (SG type 14) printed in the unissued colour of indigo printed on white paper (31x33mm). Cut from the composite sheet. 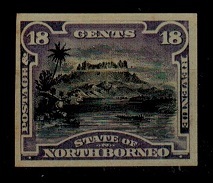 NORTH BORNEO - 1888 8c IMPERFORATE DIE PROOF printed in indigo. 1888 8c IMPERFORATE DIE PROOF (SG type 14) printed in the unissued colour of indigo printed on white paper (32x32mm). Cut from the composite sheet. 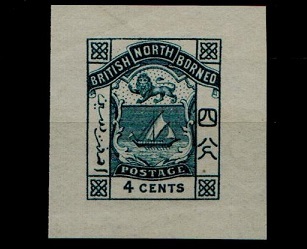 NORTH BORNEO - 1888 4c IMPERFORATE DIE PROOF printed in indigo. 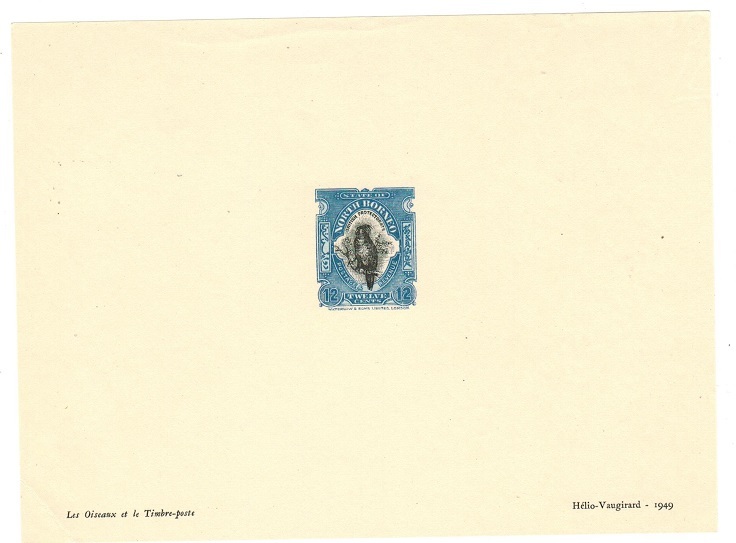 1888 4c IMPERFORATE DIE PROOF (SG type 14) printed in the unissued colour of indigo printed on white paper (31x33mm). Cut from the composite sheet. NORTH BORNEO - 1916 10c rate cover to USA used at JESSELTON. 1916 (SEP.16.) 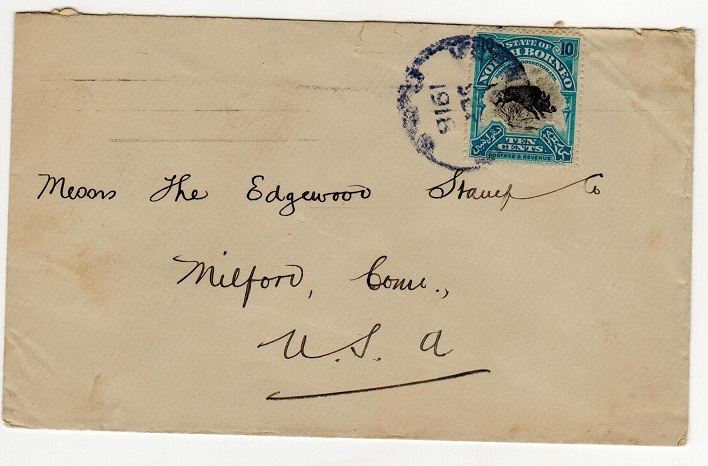 cover addressed to USA bearing 10c adhesive tied by rather smudged rubber type JESSELTON/B.N.G. cancel struck in 'violet' ink. 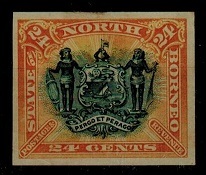 NORTH BORNEO - 1890 1c orange-yellow PSC used at SANDAKAN. H&G 7. 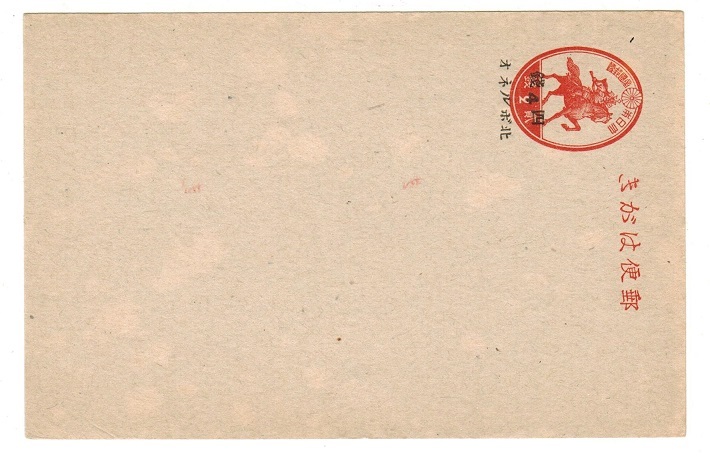 1890 1c orange-yellow on white postal stationery postcard addressed locally and with short message on reverse side cancelled by SANDAKAN cds dated 7.SEP.94. H&G 7. 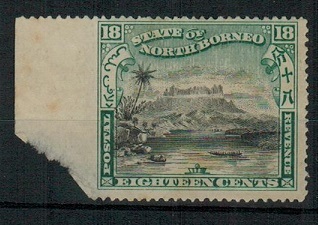 NORTH BORNEO - 1894 3c+3c blue PSRC unused. H&G 11. 1894 3c+3c blue on cream postal stationery reply type postcard in fine unused condition. H&G 11. 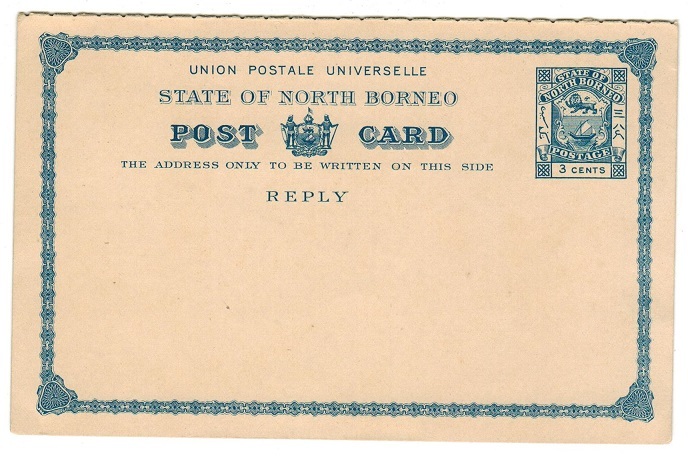 NORTH BORNEO - 1909 4c rate postcard use to UK used at LAHAD DATU. 1909 (MAY.21.) 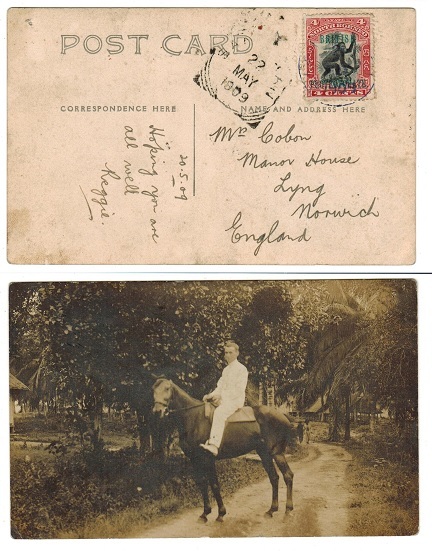 use of real picture postcard addressed to UK depicting 'rider on horseback' bearing 4c 'British/Protectorate' adhesive tied by light violet LAHAD DATU cds and with squared circle SANDAKAN transit strike alongside the following day. A scarce use. NORTH BORNEO - 1944 '4c/KITA BORNEO' provisional Japanese Occupation postcard unused. JAPANESE OCCUPATION - 1944 'Japanese Warrior' red on buff postal stationery postcard ovpt'd in black '4c/KITA BORNEO' in Japanese. An exceedingly rare PROVISIONAL occupation card. 1937 (MAY.19.) 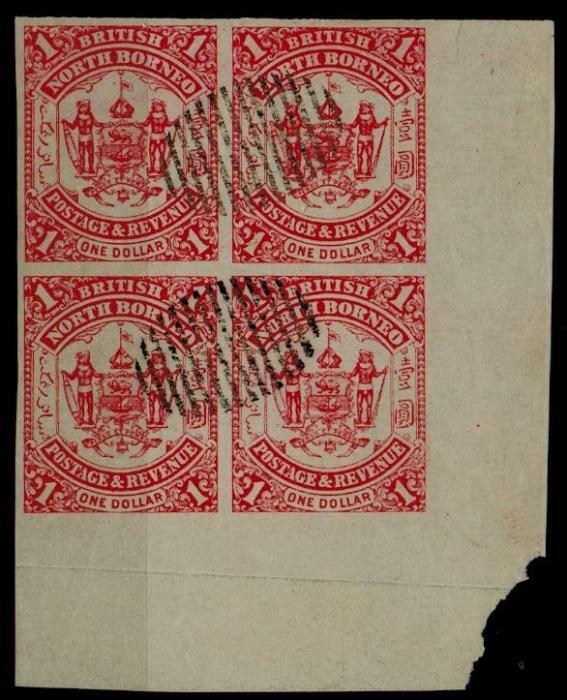 cover marked 'Imperial' in manuscript bearing 5c adhesive tied in combination with 20c on 18c surcharge adhesive (SG 177+258)tied JESSELTON/NORTH BORNEO. 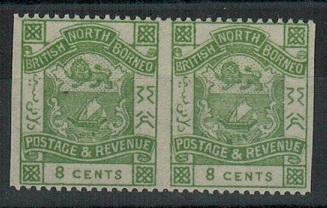 NORTH BORNEO - 1882 8c green IMPERFORATE BETWEEN mint pair. Presumed a forgery. SG 43a. 1888-92 8c 'perf 14' yellow-green (SG 43a) in a fine unmounted mint horizontal pair showing the variety IMPERF BETWEEN. Unlisted and presumed a forgery. 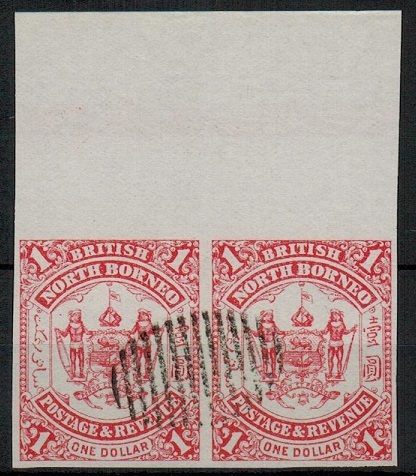 NORTH BORNEO - 1941 censor cover to UK used at SANDAKAN. 1941 (OCT.21.) 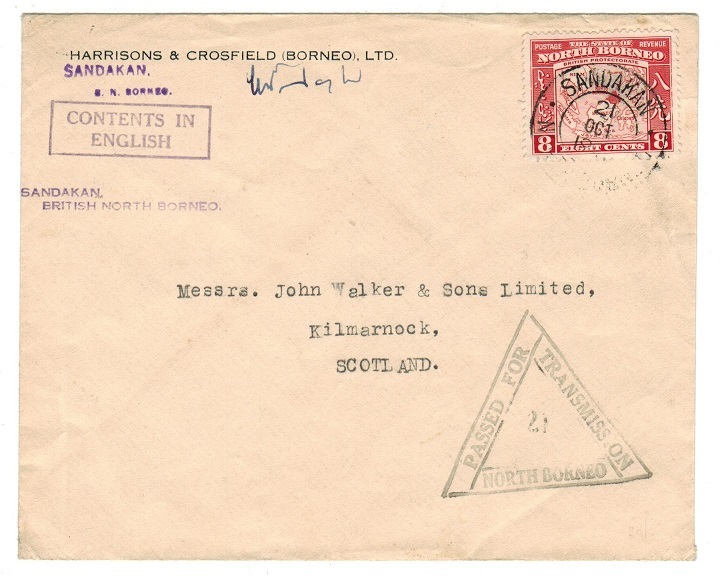 commercial cover to UK bearing 8c adhesive tied by SANDAKAN cds with black triangular PASSED FOR/TRANSMISSION/21/NORTH BORNEO censor strike below. Morenweisser type 2. 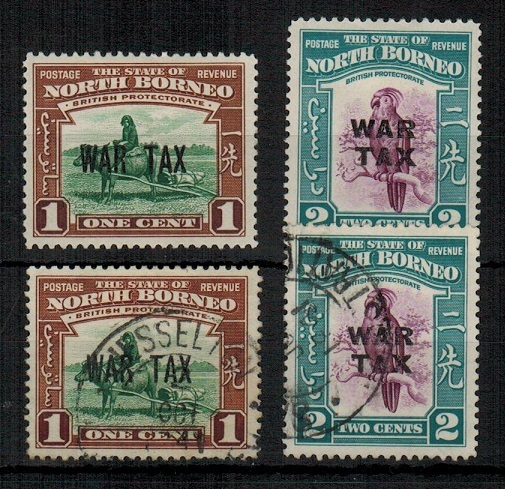 NORTH BORNEO - 1941 1c + 2c 'War Tax' stamps mint and used. SG 318-19. 1941 1c and 2c 'War Tax' adhesives in fine mint condition and in fine used. SG 318-319. NORTH BORNEO - 1894 25c indigo IMPERFORATE horizontal pair with 14 barred duplex. SG 81a. 1894 25c indigo (SG type 32a) bottom left corner marginal IMPERFORATE HORIZONTAL pair cancelled by 14 barred duplex in black. SG 81a. 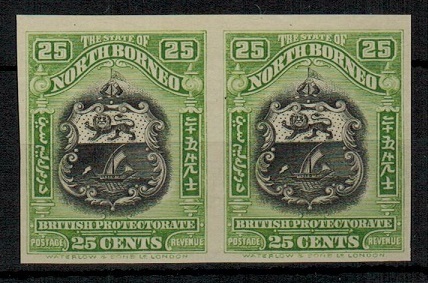 NORTH BORNEO - 1943 2c,4c,6c and 8c POSTAGE DUES overprinted for JAPANESE use. 1943 2c,4c,6c and 8c POSTAGE DUE set (Barefoot and Hall 30-33) overprinted with Japanese characters in black together with four bars printed by the Japanese to seal registered envelopes after censorship. A fine and scarce series in fine mint condition. 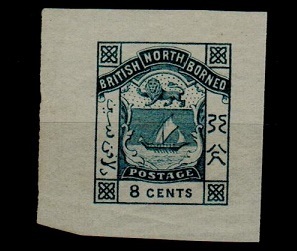 NORTH BORNEO - 1888 25c PERFORATE COLOUR TRIAL in light blue. 1888-92 25c (SG type 15) PERFORATED COLOUR TRIAL on gummed paper printed in light blue. 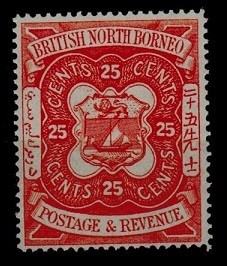 NORTH BORNEO - 1888 25c PERFORATED COLOR TRIAL IN salmon. 1888-92 25c (SG type 15) PERFORATED COLOUR TRIAL on gummed paper printed in salmon. 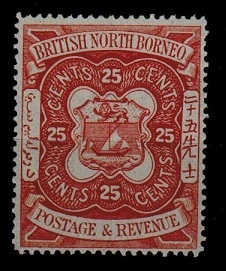 NORTH BORNEO - 1888 25c PERFORATED COLOR TRIAL IN orange. 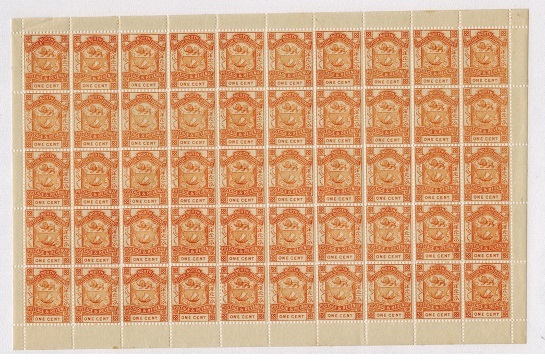 1888-92 25c (SG type 15) PERFORATED COLOUR TRIAL on gummed paper printed in orange. NORTH BORNEO - 1952 H.M.S.ALACRITY maritime cover to USA from JESSELTON. 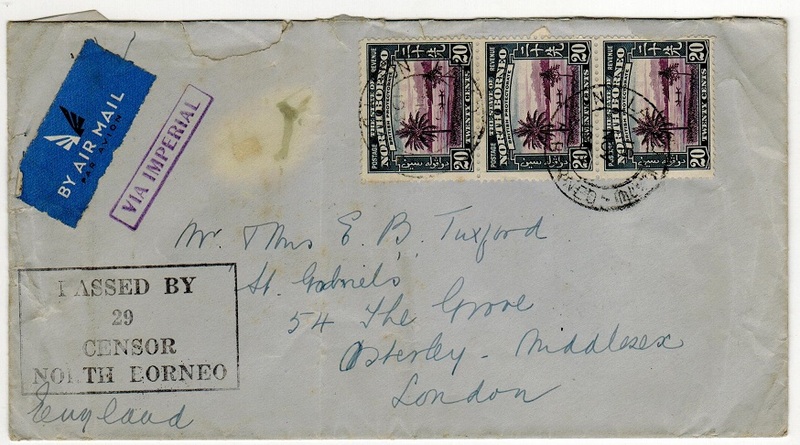 1952 cover from UK addressed to USA bearing GB 1 1/2d adhesive (uncancelled) & with magenta boxed SHIPS OFFICE/1.JUN.1952/H.M.S.ALACRITY maritime h/s applied at bottom. North Borneo 8c applied on route & cancelled by JESSELTON/NORTH BORNEO cds dated 25.JUN.52. NORTH BORNEO - 1955 TRAIN MAIL/NORTH BORNEO cover to Beaufort. 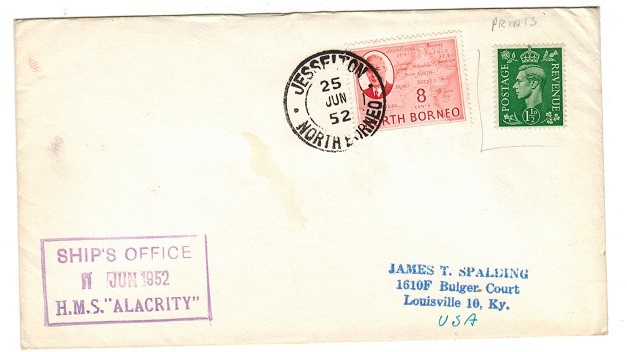 1955 (SEP.1) cover addressed locally & bearing 10c (SG 378) tied by fine TRAIN MAIL/ NORTH BORNEO cds. 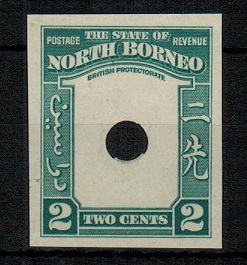 NORTH BORNEO - 1911 25c black and yellow green IMPERFORATE single. 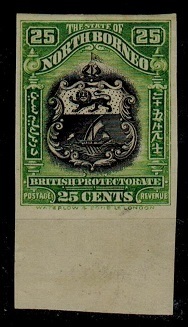 1911 25c black and yellow green 'arms' adhesive (SG type 64) in a fine bottom marginal IMPERFORATE single. 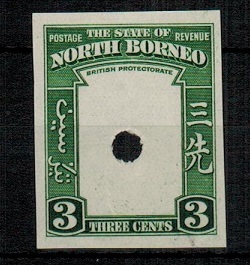 NORTH BORNEO - 1894 24c IMPERFORATE PLATE PROOF. 1894 24c IMPERFORATE PLATE PROOF (SG type 32) printed in the unissued colours of green and orange-yellow on ungummed paper. 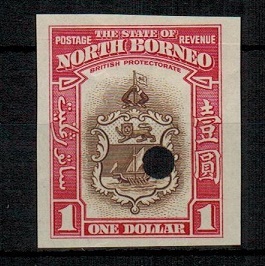 NORTH BORNEO - 1894 18c IMPERFORATE PLATE PROOF. 1894 18c IMPERFORATE PLATE PROOF pictorial (SG type 28) printed in the unissued colours of black and lilac on ungummed paper. 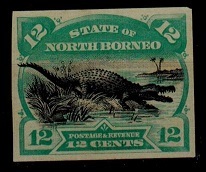 NORTH BORNEO - 1894 12c IMPERFORATE PLATE PROOF. 1894 12c IMPERFORATE PLATE PROOF (SG type 32) printed in the unissued colours of black and blue-green on ungummed paper. 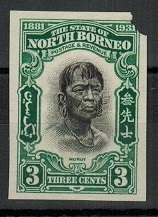 NORTH BORNEO - 1931 3c IMPERFORATE PLATE PROOF. 1931 3c 'Head Of Murut' IMPERFORATE PLATE PROOF (SG type 73) printed in the issued colours of black and blue green on ungummed paper. Light ironed out vertical crease and with official secity punch hole at top right corner clipping edge. 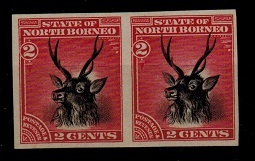 NORTH BORNEO - 1894 2c IMPERFORATE PLATE PROOF pair. 1894 2c IMPERFORATE PLATE PROOF of the 'Sambar Stag' (SG type 25) in the issued colours of black and lake on thin ungummed paper. 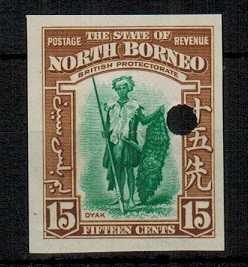 NORTH BORNEO - 1894 6c IMPERFORATE PLATE PROOF. 1894 6c IMPERFORATE PLATE PROOF pictorial (SG type 28) printed in the unissued colours of black and green on ungummed paper. NORTH BORNEO - 1939 1c IMPERFORATE PLATE PROOFS of frame/vignette/frame only etc. 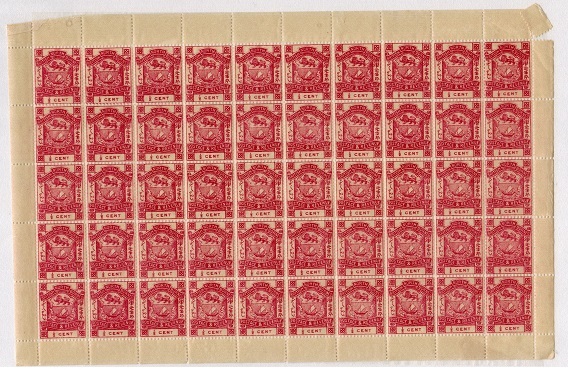 1939 2c IMPERFORATE PLATE PROOFS of (SG type 82) in issued colours. One of the frame only the other of the frame and vignette each with official security hole in centre. (2 proofs). 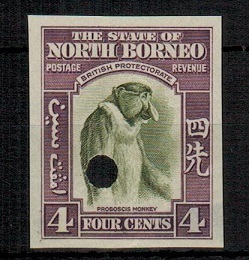 NORTH BORNEO - 1939 4c COLOUR TRIAL with WATERLOW & SONS overprint. 1939 4c bronze-green & grey COLOUR TRIAL of the Proboscis Monkey issue on perforated gummed paper with small official punch hole & diagonal Specimen/Waterlow & Sons Ltd struck in black. 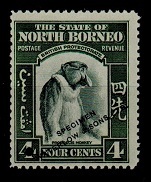 NORTH BORNEO - 1939 20c COLOUR TRIAL with WATERLOW & SONS h/s. 1939 20c COLOUR TRIAL printed in violet & bright-green (SG type 81) on perforated gummed paper & ovpt'd WATERLOW & SONS LTD/SPECIMEN with small official punch hole. 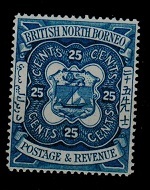 NORTH BORNEO - 1888 25c PERFORATED COLOUR TRIAL in slate blue. 1888-92 25c (SG type 15) PERFORATED COLOUR TRIAL on gummed paper printed in slate blue. 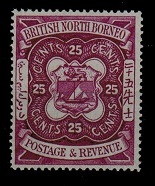 NORTH BORNEO - 1888 25c PERFORATED COLOUR TRIAL in plum. 1888-92 25c (SG type 15) PERFORATED COLOUR TRIAL on gummed paper printed in plum. 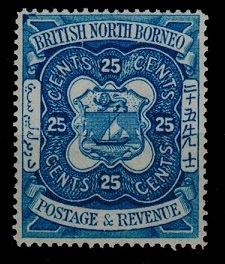 NORTH BORNEO - 1888 25c PERFORATED COLOUR TRIAL in indigo. 1888-92 25c (SG type 15) PERFORATED COLOUR TRIAL on gummed paper printed in indigo. 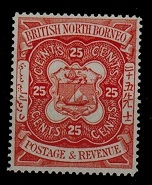 NORTH BORNEO - 1888 25c PERFORATED COLOUR TRIAL in pale orange. 1888-92 25c (SG type 15) PERFORATED COLOUR TRIAL on gummed paper printed in pale orange. NORTH BORNEO - 1894 $1 scarlet IMPERFORATE PROOF struck FAUX. 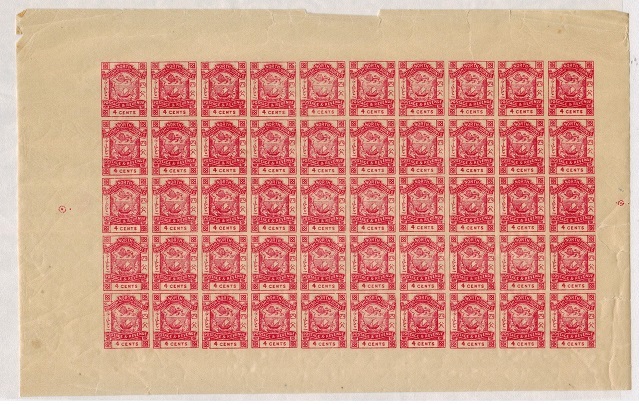 1894 $1 scarlet IMPERFORATE example with large red outer squared colouring (SG type 32c) on thin ungummed paper of the FOURNIER forgery overprinted FAUX in small lettering and still partly adhered to original proof booklet sheet. 1896 25c IMPERFORATE PLATE PROOF (SG type 32a) printed in the issued colour of green but WITHOUT OVERPRINT and with an additional strike on the reverse but MISPLACED. 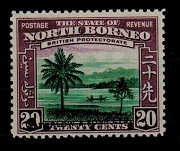 Taken from waste sheets and sold by the BRITISH North Borneo Company to collectors. 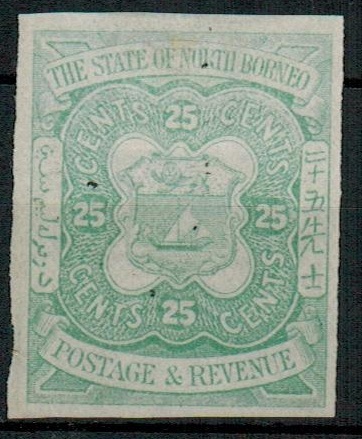 NORTH BORNEO - 1886 25c IMPERFORATE pair with QUADRUPLE PRINT, ONE INVERTED. 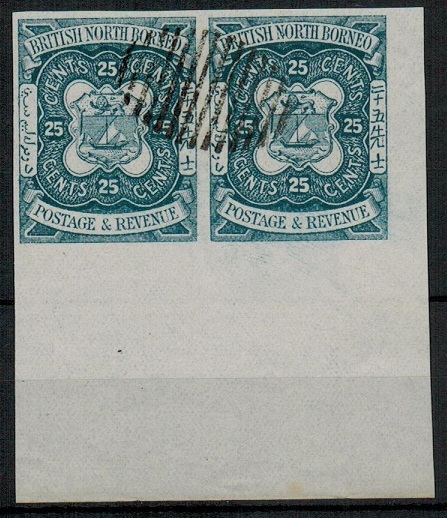 1886-87 25c IMPERFORATE pair printed in green (SG type 10) but showing the variety QUADRUPLE PRINT, ONE INVERTED. Ex printers waste. 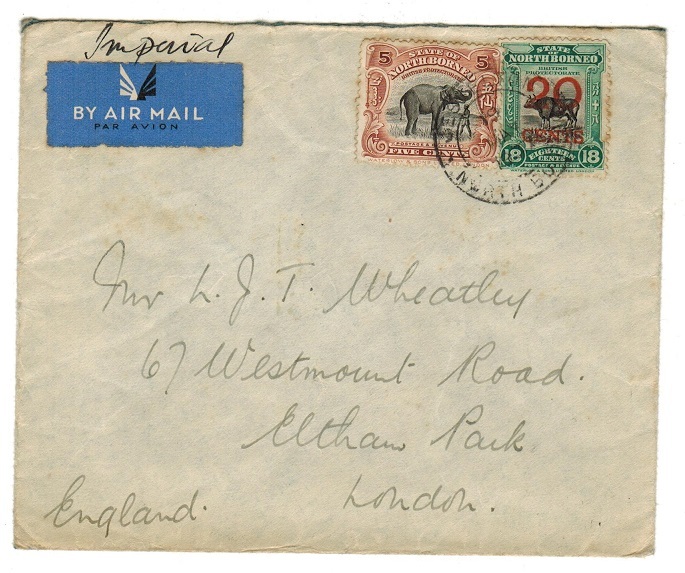 NORTH BORNEO - 1936 'Imperial' 25c rate cover to UK. 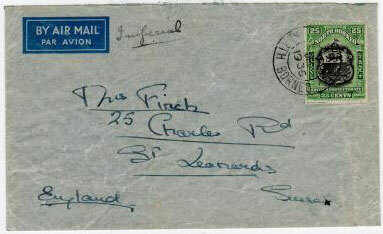 1936 (DEC.7) cover to UK bearing 25c (SG289) tied by s/r SANDAKAN/NORTH BORNEO cds with JESSELTON transit b/s. 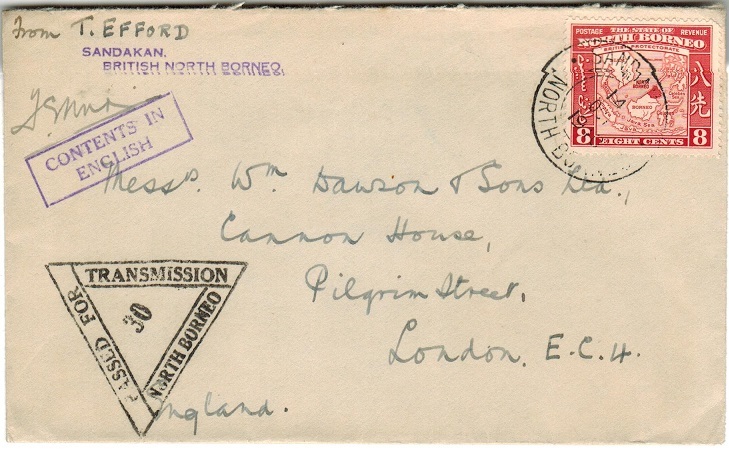 NORTH BORNEO - 1924 6c SANDAKAN cover to UK. 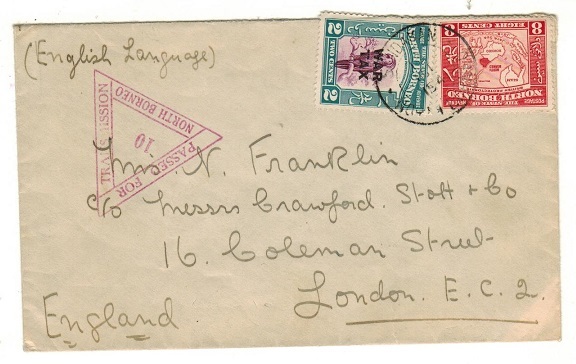 1924 (MAY.6) cover to UK bearing 6c (SG167) tied by s/r SANDAKAN/B.N.G. cds. NORTH BORNEO - 1947 UPU folder. 1947 UNIVERSAL POSTAL CONGRESS-PARIS 1947 UPU commemoration folder. Very scarce and only given to UPU delegates.